September 11, 2008, on a day that one’s thoughts tend to drift toward negative memories, Biscayne Bay Campus attempted to look forward and focus on peace. BBC-SGA President, Ana Maria Silva closed the dedication ceremony with moving words of inspiration and hope. In a final show of unity, each speaker took hold of a piece of ribbon that had been attached to the top of the eight sided Peace Pole. 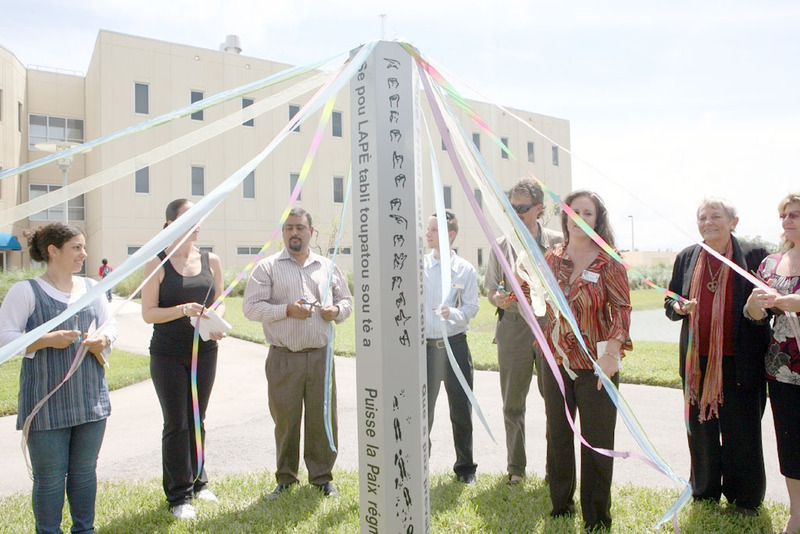 The Peace Pole was adorned with eight plates, expressing the message, May Peace Prevail on Earth in Arabic, German, Portuguese, Spanish, English, Chinese, Creole, Hebrew, French, Tibetan, Sign and paw-prints in honor of the animal kingdom. In unison, each person cut a portion of ribbon to conclude the dedication.